Welcome to Pinball Expo 1994! Not many websites have gone unchanged in the last two decades, but there are a few. For example, for god knows what reason, the Space Jam web site is still out there, and is exactly the same as back in 1996. 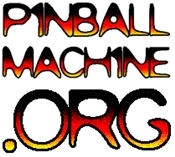 The Pinball Expo site from 1994 is also one such site. Not sure if this is an archive of it or the original, maybe someone who remembers back that far can comment.